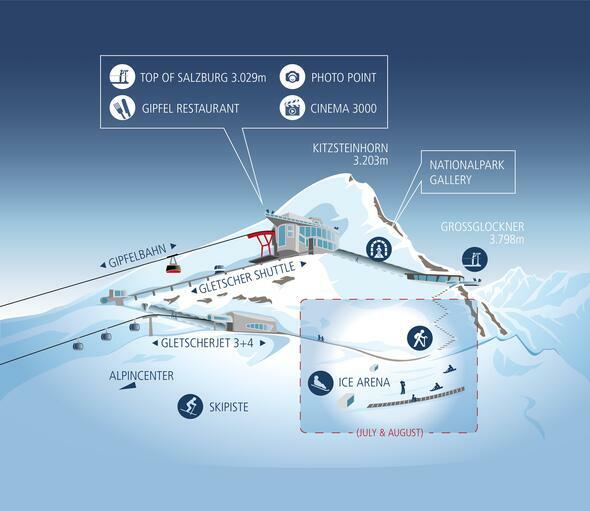 Whether snowball fight, hilarious sliding fun across gentle snow slopes, adventurous hiking tours on the secured glacier trail or chilling out on sun loungers at the glacier plateau – the Ice Arena at the glacier of the Kitzsteinhorn offers summer snow fun for families and nature lovers. The Ice Arena is open from 29.06.2019 until approx. beginning of September 2019! Using the top-modern cable cars of the Kitzsteinhorn, the Ice Arena is easily accessible for adventurers of all ages during the summer months. Race across the white glacier slope on slide sheets and toboggans, which can be hired free of charge on site, and take the magic carpet for a comfortable return to the start. Other guests swim in the crystal-clear Lake Zell in the valley while you enjoy the Ice Arena with snowball fights, building snowmen or chilling out on loungers during a relaxing break. The Ice Arena Snack Bar serves food for hungry snow adventurers and anyone keen on activity enjoys the secured glacier trail.